I love those simple recipes that you can whip up in less than 20 minutes for supper! I have been making these for years and hubs thinks they are amazing and that I have been slaving all day in the kitchen! Not true!! Add any ingredients you like on your sandwich, I like onions, peppers and mushrooms, but be creative, don’t let me stop you! I love a hard roll that doesn’t get soggy from the juices of the meat. Mozzarella is a great cheese for this yummy sandwich, it doesn’t have an overpowering flavor allowing the fabulous grilled veggies flavors to come through and gets ooey gooey melty for your sandwich! In a large non stick pan, add 1 Tbsp Olive oil over medium heat, add veggies, saute for about 5 minutes, scooch over to side of pan, add steaks, season both sides, keep stirring veggies on side of pan, so that they don’t stick, add more EVOO if they start to stick. After a couple minutes, flip steak over, cook until done-ness of your liking, I like well done, hubs likes rare. Add cheese on top of steak, cover with lid so cheese melts. Toast roll or if fresh, just place steak and veggies over roll, cut in half or put that bad boy in your mouth! 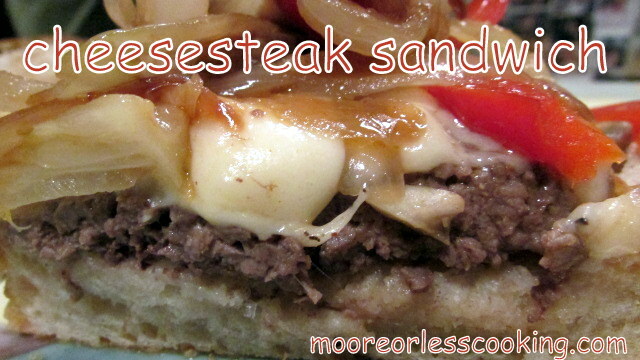 xoxox— great recipe Cheese-steak is a big thing with me!! This looks really good. I wish I knew where to find chopped steaks anymore. Very hard to come-by around where I live. Thank you LS, can you ask your butcher at your market? Thanks Nettie. I’ll have to check. I never really see a butcher in our local stores anymore. I live in a *very small* community. I will ask maybe the store manager and see what they can do. I really would like to give these a try. I think my family would love them! P.S. I found your page from following Po Man meals. I will follow you. Your page looks great! Now THAT’S a yummi sandwich! Stumbled and Pinned! Wow tempting sandwich recipe. Love to try it!